Campaign Application: This is when an influencer applies to participate in one of the campaigns you've published on the linkr network. By applying, the influencer has already accepted the terms and conditions you have set in your campaign briefing. You can decide if you would like to accept or decline the application. Cooperation Request: This is an individual cooperation proposal from an influencer, outside of any other campaigns you might have running at the time. The terms and conditions are set by the influencer in their proposal and it is up to you to accept or decline the request under these terms. 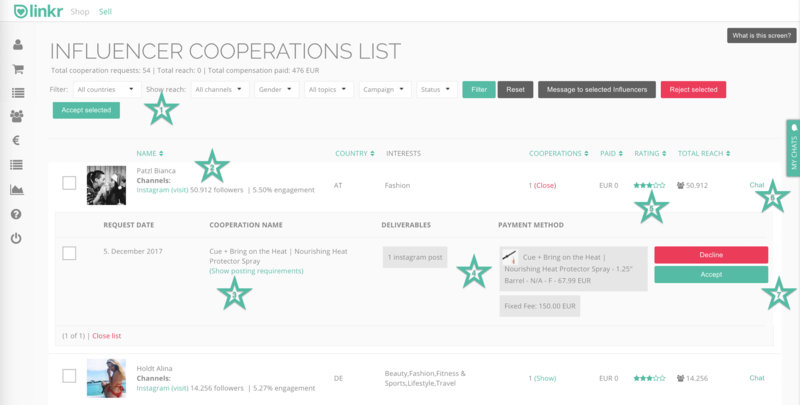 Both cooperation types are added to your Influencer Cooperation List, providing you with a central overview of all cooperations with influencers on linkr. Alongside with status information on the cooperation, you will find performance metrics on the influencer as well as the defined / requested compensation. Furthermore, you are able to check the social profiles of each influencer or even personally chat with each applicant to clarify any pending questions. Pro-tip: this blog post lists a couple of key areas to take into consideration when it comes to deciding who's application to accept and who's not. You can use filters to narrow down the list of displayed cooperations - e.g. only show YouTube or only show applications for the "summer sale campaign". Check the social profiles of the influencer and have a look at key metrics such as audience size or average engagement on the most recent posts. This lists the influencer compensation set for this cooperation. Compensation can be fixed fees (e.g. $ x per post), performance based fees (e.g. $ x per click), free product samples,... or any combination of the previously listed methods. This show the average rating that this influencer did receive from other brands on linkr. Please note that also influencers will rate you and your brand at the end of each cooperation. In case you have questions to a specific influencer or if there are further details to clarify, you can use the built-in chat. Finally, based on all data at hand, you need to decide whether or not you'd like to accept or decline the cooperation request. Either way, the influencer will receive a notification, informing them about your choice. You will have the opportunity to customise the notification before it is being sent to the influencer. Note on product samples: If free product samples are part of the campaign, then the influencer will select their color, size, etc. of choice during the campaign application / request submission process. Also, influencers will leave their shipping address. Once you choose to accept the cooperation request, you will see the required shipping details on Order Manager.